Gordon's Gin & Tonic with a Dash of Elderflower Can is a popular Pre Mixed Drinks available from Tesco Groceries in 250ml to buy online. Visit Tesco Groceries for the best price for 250ml of Gordon's Gin & Tonic with a Dash of Elderflower Can or compare prices on our other Pre Mixed Drinks products. A new long drink for any Gin lover to try, Gordons G&T with a touch of Elderflower. Available in a premix this is sure to appeal to anyone looking for a twist on a classic. Where to buy Gordon's Gin & Tonic with a Dash of Elderflower Can ? 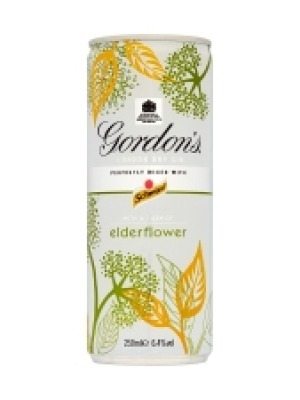 Gordon's Gin & Tonic with a Dash of Elderflower Can Supermarkets & Stockists. You can buy Gordon's Gin & Tonic with a Dash of Elderflower Can online in most retailers and find it in the Pre Mixed Drinks aisle in supermarkets but we found the best deals online for Gordon's Gin & Tonic with a Dash of Elderflower Can in Tesco Groceries, DrinkSupermarket.com, and others. Compare the current price of Gordon's Gin & Tonic with a Dash of Elderflower Can in 250ml size in the table of offers below. Simply click on the button to order Gordon's Gin & Tonic with a Dash of Elderflower Can online now.